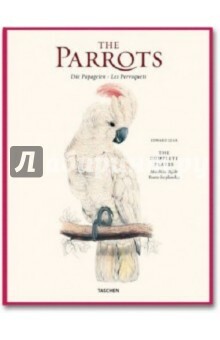 Аннотация к книге "Edward Lear, The Parrots"
During Lear's time, live parrots were rare and much sought-after, bought and sold for large sums by wealthy amateurs of natural history, and prized by 19th century European aristocracy for their astonishing plumage and mimickry of the human voice. Naturally, fine drawings of them were also highly prized. One of the first collections entirely dedicated to the species, Parrots includes African, Australian, and American parrots bred by eminent ornithologists such as Sir William Jardine and Prideaux John Selby, who sponsored Lear, inspiring and directing his work. Unlike other avian illustrators who often worked with stuffed birds, the young and prodigiously talented Lear (1812-1888) made his drawings from live parrots, capturing their expressions and movements in remarkably lifelike illustrations. The new medium of hand-colored lithography facilitated the vivid elegance of Lear's work. Скачать Edward Lear, The Parrots - Solinas, Willmann, Willmann.